(TibetanReview.net, Jun03, 2018) – Seeking a proper implementation of Beijing’s so-called bilingual education system in ethnic minority areas, Tibetan students in Tsoshar (Chinese: Haidong) Prefecture of Qinghai Province have asked for the recruitment of more teachers able to teach not just in the officially dictated Mandarin language but also Tibetan, reported the Tibetan Service of rfa.org Jun 1. In a petition written to local authorities at the beginning of the 2018 school year, they have complained that none of the 359 newly hired teachers could give instruction in both the languages. The petition was also cited as saying that in the prefecture’s Yazi (Xunhua) and Palung (also called Bayan, Chinese: Hualong) counties, only 270 teachers were able to teach in Tibetan, serving a student population of 9,800. The petition referred to other issues as well, the report suggested, pointing out that in one Yazi County school alone, 10 out of 14 instructors were only substitute teachers, not fully trained ones. 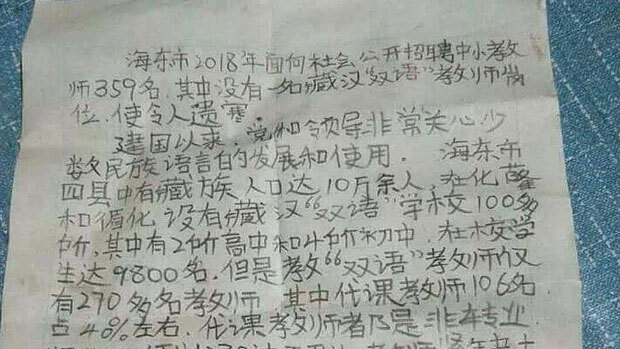 The report pointed out that a move made by Qinghai authorities in Oct 2010 to make Mandarin the sole language of instruction in the Tibetan schools had to be postponed after it met with large-scale protests by Tibetan students concerned about the erosion of Tibetan language, culture, and national identity in Tibetan areas of the PRC.